Hi friend! I hope you’re having a beautiful week. 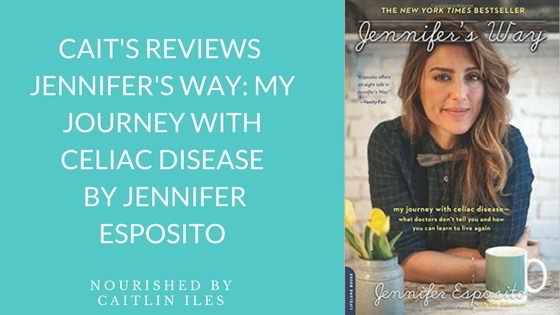 Today I want to share a review of a book I read last week by Jennifer Esposito called Jennifer’s Way: My Journey With Celiac Disease—What Doctor’s Don’t Tell You & How You Can Learn to Live Again. While the title is quite the mouthful, the book was absolutely incredible. If you have celiac disease, are struggling with your physical or mental health, or you love someone with Celiac disease I cannot recommend this book highly enough. As some of you may know, I have several family members with Celiac disease and I have been gluten-free myself for almost 6 years. I thought I knew a lot about how the disease can manifest physically, emotionally, and psychologically in the body. However, after reading this powerful book by Jennifer Esposito I have a whole new appreciation and empathy for what my friends and clients with celiac disease live with on a daily basis. Part One of the book is written in the style of a memoir and tells the story of Jennifer’s life-long struggles with health issues and how it impacted her career and relationships. Her writing is raw, brutally honest, and vulnerable. There were several times throughout the book where I was brought to tears by her struggle to be heard by her family and doctors to find out what was wrong with her, when she was told for so long that essentially it was all in her head. Even once she was diagnosed she highlights how she didn’t see improvements in her symptoms because she had spent so long not absorbing or assimilating her food that her deficiencies were stalling her recovery process. In Part Two she highlights some of the diet, career, and lifestyle changes she made that supported her during her recovery. She gives practical advice about where gluten is often hidden and how to eat out at restaurants. She also highlights some steps that can be taken by those who are newly diagnosed and by those who are a bit further along in their journey. Finally, the last part of the book contains really delicious, simple recipes that can help make the transition to a gluten-free lifestyle a bit easier. Throughout the book she stresses that these were the strategies that worked best for her and that they can provide a starting point, but ultimately it’s important to listen to your body and find out what works best for your situation. I love that she encourages you to be your own advocate and your own scientist to figure out what kinds of foods are going to support your health and what kinds of changes you need to make to your lifestyle in order to find your new normal. Ultimately, I think this book is so incredibly powerful because she gives a voice to the many diagnosed (and undiagnosed!) celiac sufferers who have spent years struggling with misdiagnoses, being ignored by doctors, and just generally feeling scared, alone, and struggling to adjust to their new normal. She is honest, she is empathetic, and she understands how frustrating, scary, and sometimes downright sh*tty it can be to have to be so careful about what you put in and on your body. I think it is this passion and honesty that resonates most as you read. I could not put this book down and I think having read it, I will be a better, more compassionated practitioner, friend, sister, and niece to the people in my life who live with a “silent” disease on a daily basis. I stress again that if you have celiac disease, if you struggle with undiagnosed health issues, or you love someone with celiac disease then reading this book could cause a huge shift in your perspective or offer some clarity to your confusion. You can check it out on Amazon and read some reviews right here. As always, thanks for reading friend! Have a beautiful day!